Tired of having Malay and curry food? Then find this place although it may require some effort. 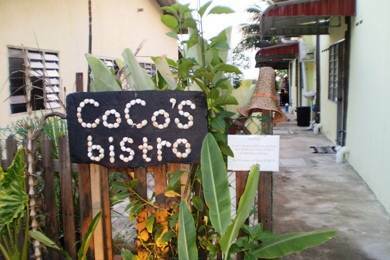 While Coco's Bistro is located in Pantai Kok area, it's on a back road in a fisherman's village area and by the bay. You should get the direction before you head for it and it will be worth the effort. NOTE: Please check the updates at the bottom to know the latest location of the bistro. They have changed venue several times. The small open air (roof covered al fresco) dining area is run by the lady Coco and her Irish boyfriend Steve (Stephen Comer). While Coco manages the guests and the staffs in the dining area, Steve is the chef. The restaurant is located at the backside of the small hotel Tidoq Inn. A narrow passage from the left leads to the bistro at the end. Over all the atmosphere is casual and very friendly. It is set up in a cozy bistro style. There is a bar at one end. Coco and her staffs are always very energetic and smiling to make you comfortable. If it's not raining, they also put up tables outside. If you are planning for dinner, come by 6:30pm. The view of the sunset over the Rebak island on the sea is awesome. 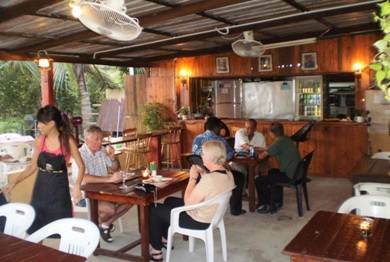 This restaurant is favorite to the expats living in the island. Almost any day you come, you will see most tables are occupied by expats. But there are many tourists as well who like to take a break from the traditional Malay or Chinese food that are so prevalent in the island. So what are our favorite dishes here? Well with the Irish man at the helm of the kitchen what do you expect? Of course the Irish Stew. But Steve is far more capable than just that. After all he was the head chef for many years in the luxury cruise ship Queen Elizabeth II. Most of the items that we have tried here taste delicious. The menu is rather small but that is how they ensure the quality. The portions are quite large and sufficient. Here are some more dishes that are our top favorites here ... the Rib Eye steak is really tender and excellent, the Hungarian Goulash (another meat rich stew) is a great favorite, the Barracuda Fish n' Chips has the freshest fish and the chips are served really hot & crispy. They also make vegetarian food like veggie cottage pie. Finally finish off with the dessert Flaming Mount Kinabalu (the homemade dessert of the day changes daily). And all these at very affordable prices. The main courses are from RM17 to RM32, the homemade dessert RM8. Note that there are no appetizers on the menu. While the food is reasonably priced, drinks like beer and wine are really cheap. Beers are RM3 to RM5 for a small bottle and a glass of house wine is RM5. So over all a great value for money and that too with a very friendly & cheerful host. They serve only dinner from 5:30pm until 11:00pm. Closed on Wednesdays. They accept only cash. While walk-ins are welcome, reservations are recommended on week ends. Update 2013: Coco's Bistro has moved to a new location and the ambience while still great, is radically different from what it used to be. From a rustic bistro setup it has been now transformed to a completely modern bar & restaurant. The menu and the prices have remained more or less the same. You will still get the old good taste of the cottage pie and Irish stew. Coco's Bistro is now located at the basement car park of the plush Laguna Apartments. It's about 3kms from Langkawi Airport towards Pantai Kok (but in Padang Matsirat area). There are no roadside sign boards, so like before, it may not be easy to find the bistro. Just ask the taxi driver to drop you at the Laguna Apartments, then walk down to its basement car park and you will find Coco's Bistro. Update January 2015: Coco's Bistro has moved again. This is what Steve wrote to me: "Hi Raj, Thanks again for including our bistro on your site. Just to let you know, we have moved again. This time we hope to stay for good. It is a beautiful mature garden setting. covered and open air seating. Kind Regards, Steve and Coco". They have moved to Chandek Kura (on the way to Kuah). The small bar is excellent and as usual the rib eye steaks are superb. There is no smoking restrictions. But it's spacious and overall ambience is great. Ample car park is available on the roadside. From the airport as you go towards Kuah, after the second traffic light, it's about further 100 meters and on your left on the main road.